What does Community-Engaged Scholarship look like in practice? Faculty can work towards the university's mission towards the public good in many ways. Our approach is to start from community-defined priorities, which can take many forms for faculty and students. Below, we offer examples from across the University of Michigan. 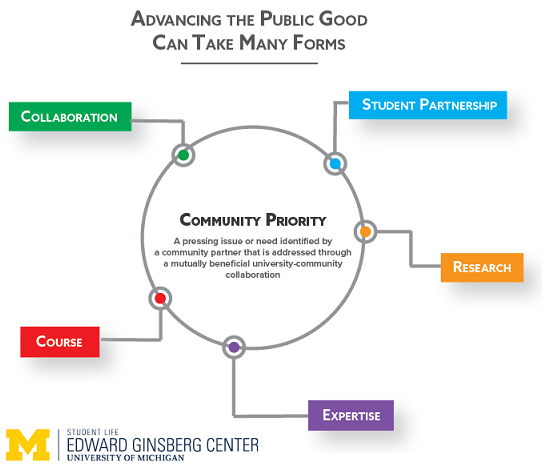 Faculty can connect with community-defined priorities in a number of ways, as illiustrated by the simple graphic on the right. Below we offer examples from across the university of each type of engagement, related to a variety of community priorities.